These are similar to sour plums, and eaten in Thailand as a snack with sugar and chilli. They come from the center of Thailand. As you often find with Thai food it is a mixture of 3 flavours, the sourness of the plums, eaten with a mixture of sugar and chilli with a pinch of salt. 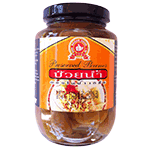 Product of Thailand.